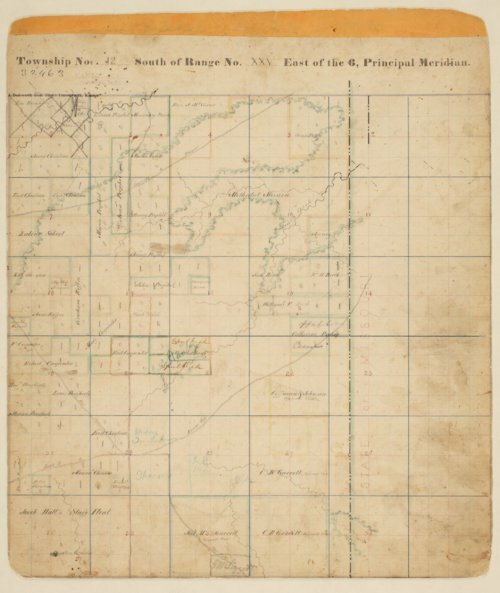 A plat map showing township 42, range 25, east of the 6th principal meridian. The U.S. Surveyor General began surveying Kansas after the passage of the Kansas-Nebraska Act of 1854. Plat maps were created at that time to document the surveys. The plats show public lands within the territory divided by range, township and section. Townships were measured in six mile increments starting from the Kansas-Nebraska border. Ranges were numbered in six mile increments east and west from the Sixth Prime Meridian, which crosses through present day Wichita, Kansas. This system is still the basis for legal land description in the state.